The Pencil tool creates central lines as you draw on vector layers, adding each stroke on top of the previous ones. When you select the Pencil tool, the Tool Properties view displays the different Pencil modes that control how the pencil line is drawn. 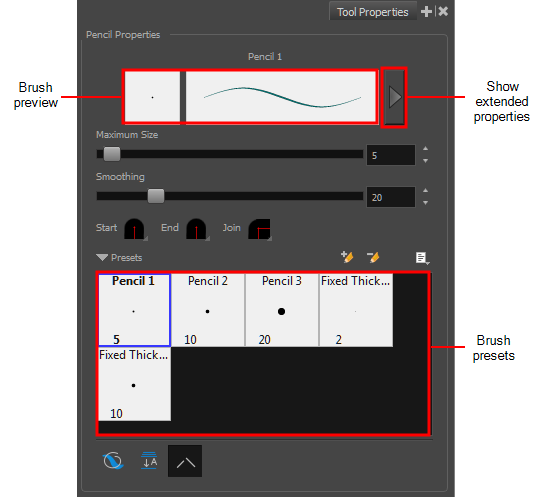 For tasks related to this tool, see About the Pencil Tool and About Pencil Modes. In the Tools toolbar, click the Pencil button. Makes the beginning of the line round or flat. Makes the end of the line round or flat. Makes joints round, mitred or bevelled. Automatically closes strokes with an invisible stroke.